Job Hunting can be mind boggling. Knowing what kind of job you are qualified for can be intimidating. Don’t let things overwhelm you. Think of the positives and form a plan to accomplish your goal. First thing I do when anything is overwhelming me is make a list. Network – let everyone know you are looking. Do you volunteer, let the board know you are looking for a new job. Play sports or children play sports, teams are a great place to network. The gym, yoga studio – everyone knows someone who knows someone and most people are more than happy to lend a hand. Use a Recruiter. Recruiters have job boards sometimes exclusive to them. Research your recruiter and find the one who deals with the companies on your list of places you would like to work. Also find the Recruiter who deals with your skills. Recruiters specialize – IT, Finance, Admin, etc so make sure you contact the right one. Be diligent don’t them forget about you, keep in touch with him/her. Check the job boards. Don’t be afraid to recontact your Recruiter and let him/her know about job openings. Check specific company websites. Again before applying online check with your Recruiter to see if he has a contact there. There is a job out there with your name on it. We’re trying something new here at P4Social. Instead of posting Job Tips everyday, we will post a weekly top 10 lists of our hottest tips for a given topic. 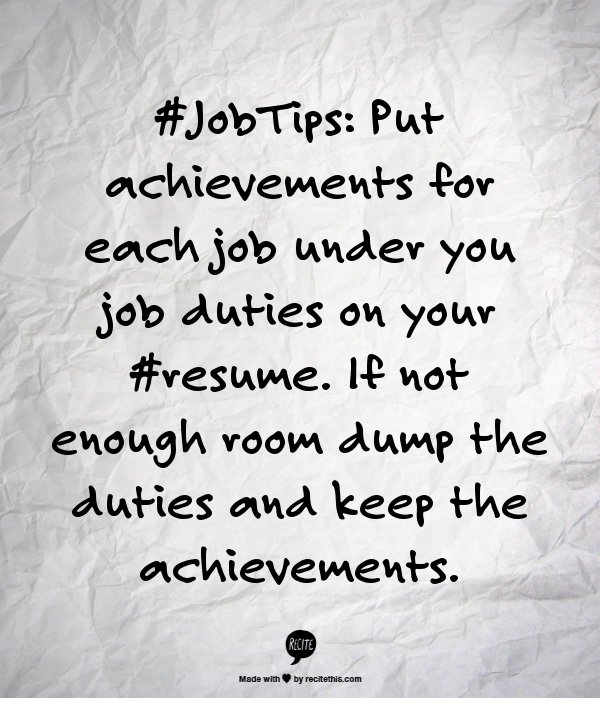 Tip: Put achievements for each job under you job duties on your #resume. If not enough room dump the duties and keep the achievements. “References available upon request” – the most unnecessary sentence on a person’s resume. Every job hunter, interviewer, Hiring Manager knows that the chances of being offered a position without references are NIL. Even worse than that sentence is “Referees available upon request”. Yes it is amazing the number of resumes I have seen with that sentence on it. LOL please don’t bother applying if you are sending me your referees!!! Read the job description carefully, references are usually only requested when you are getting to the offer stage. Don’t send them in if they aren’t asked for. Don’t put them on the bottom of your resume. References are doing you a favour, don’t pass along their information until necessary. Yes there are exceptions. There are a number of online company resume submission sites (usually large companies like Banks, IBM, etc) who ask for everything up front: Resume, Cover Letter and References. Don’t bother submitting to these sites unless you have all the information requested. Most employers will ask you for your references when they are getting to the offer stage. You may be given a verbal offer dependent on your references. When it’s a hot job market, employers know that you may be interviewing for more than one job. They want to let you know that they want you, but your references are the final stepping stone. 3 minimum – including someone from your current employer. Nothing better than having a reference from your current boss, this might be difficult so a colleague or team member will work. Job appropriate references are nice to have, if you are interviewing for a job as a programmer in a financial institution and you have worked for a bank before then a colleague who can relate to the actual position is a bonus. If you are a new graduate then a reference from a professor/teacher is better than your parents. Keep your references up to date. Make sure they are willing to do a positive reference for you. Send them a copy of the job description and your resume so they know what you are up to. Ask them what the best number and “time” to be reached at is. Employers use reference checking services now so calls can be made before 9, during lunch, after 5. Try and get references that would answer the question “Would you hire them again” with an emphatic “YES”. References are very careful about how they answer questions and companies don’t want to get sued so they will tend not to say anything negative, but sometimes a non answer speaks volumes. 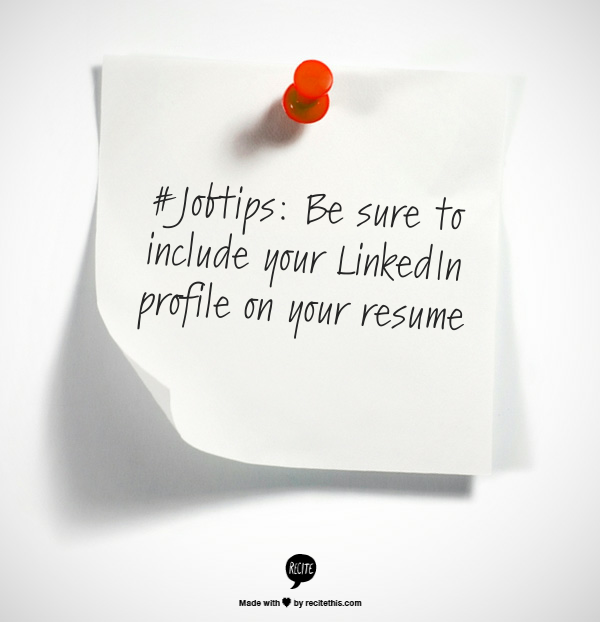 Use LinkedIn – keep in touch with the colleagues you would like to be your references. Ten (10) years ago you would call your reference and if they had left their job good luck finding them. LinkedIn makes it so easy to keep track of people and communicate with them. Keep the relationship fresh and up to date. References are an integral part of the successful job hunting journey. Always try and leave your last job on a positive note and you won’t have to worry about your reference check. Keep them up to date and keep in touch with them.